Welcome to the wonderful world of Edward Gorey ! 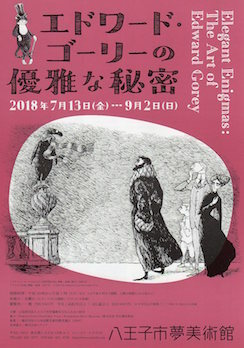 This page is only for introducing the wondeful world of Mr.Edward Gorey's work to Japanese people. I don't have any commercial purpose at all. And I don't want to infringe the copyright of Mr.Gorey and any other interested party. But it's necessary for introducing to show the Gorey's works on this page, so I decided to put them. I hope the interested party's magnanimity. Sorry, it's mainly in Japanese.